You will learn enough to get around the floor in social foxtrot, waltz, quickstep, cha cha, rumba, tango and some popular sequence dances. We also hold a Social Dance every few months for members & friends. Contact us, using the link above to confirm a place as a male/female balance will be needed. Ballroom and Latin American dance is required. The group operates on the basis of some coaching, and a great deal of dance practice. We include some sequence dancing in our sessions. We are a very friendly group with much depending on self help, and there is always of course time for coffee and biscuits. Due to the venue being somewhat small, group numbers need to be limited, and anyone interested in joining the group should first of all contact the convenor using the 'Email' link above. The Monday PM group now has a few places. Our trainer ensures that new members learn the rules quickly with the correct flat footwear and after a practice session they join in their first “end” with other members. We have good quality bowls for players to borrow in the session and many members have their own bowls. Thanks to all those who help with the setting up and tidying up after the sessions, in the true spirit of U3A, making the convenor’s job more enjoyable. We meet to play bowls for 2 hours with a break for refreshment and announcements at about 11 o’clock. We do not play in a league so there is no pressure on anyone. We play simply for enjoyment, friendship and pleasure and it helps to keep us young, fit and healthy. We have had another successful year. Our current membership is 28. 14 to 23 members attend each week with an average attendance of 17. We enjoy an Annual Lunch usually at The Gower Golf Club during March. 24 to 30 people attend. The food, venue and company are excellent. We currently have a waiting list but if anyone would like their name added to the list, please e-mail as above. The Wednesday PM Bowls Group is a new Bowls group and will be for both experienced and new bowlers. We have good quality bowls for players to borrow in the session and many members have their own bowls. Players need to wear completely flat shoes or slippers (no heel or pattern on sole) to preserve the mats. We will help new bowlers learn the basic rules quickly and after a practice they can join in their first “end” with other members. Everyone works as a team and helps with the setting up before and tidying up after the sessions, in the true spirit of U3A. No meetings in July or August - We will restart after the summer break on Wed 14th September. We will be going on cycle rides with plenty of coffee, lunch and tea stops. The rides will be selected without huge hills and will allow cyclists to join in and leave at different stages. We will try to cycle on cycle tracks and paths and keep road use to a minimum. All you will need to bring will be a roadworthy bike, any sort will do, some money and clothing suitable for the purpose. A puncture kit. a few tools and a small first aid kit would be good. A small rucksack with everything in will be needed unless you have a shopping or delivery bike with a basket. Modern Jive is a stylish blend of Jive and Salsa, and can be danced to any music with a steady beat from 40s swing to modern chart hits. It is easy to learn, lots of fun and an extremely sociable way to keep fit. The classes are taught in a friendly manner with a hint of humour. There is always time for a coffee break which turns out to be a very sociable affair. We also hold a Social Dance every few months for members & friends. The classes have grown to over 30 in number and numbers are increasing every week. With the subject as “Rambling". U3A rambling provides an alternative rambling experience to the norm. Instead of racing through the countryside as the majority of rambling clubs, time will be allowed to enjoy the views and any other happenings on the walks. Most of the walks will be about 6 to 8 miles. The start time will vary according to the meeting point and this will be notified on the website together with the type of walk, No of miles, difficulty and the grid reference etc. The walks could include the valleys and the Gower or the Brecon Canal and suggestions of future walks will of course be welcomed. Adventure is the name of the game. We may in due course experience frightening situations such as facing escaped bulls or ferocious dogs in farm yards where the leader should be protected by the group at all times. 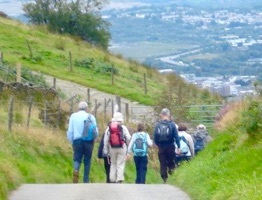 To see some photographs of the U3A Rambling Group please click here. To find out more about Short Tennis 1 (Thursday) please email or email with the subject as “Short Tennis 1". We play Short Tennis. Short Tennis is an easy-to-learn tennis-like game played on a Badminton court with a low net, a short tennis racket (21” - as generally used by children) and a soft spongy ball. It is a good game for older people; it is great fun, and keeps you supple and active without being as hard on the joints as other racket games such as tennis and squash. A number of courts are pre-booked and we can normally have additional courts according to demand. Over time Short Tennis has become increasingly popular, to the extent that sometimes we can end up with a number of people sitting out waiting to play, and in the extreme interfering with those who are playing. Depending on the day in which you are interested, there may not be room for new members. We would therefore ask potential new members to first contact the appropriate convenors using the links above, when they will either be told to come along, or be put on a waiting list. For new members, we have a number of rackets which can be borrowed for the session. To find out more about Short Tennis 2 (Friday) please email with the subject as "Short Tennis 2" . To find out more about Short Tennis 3 (Friday) please email with the subject as "Short Tennis 3" . Due to the fact that we only have one court, we limit the number of players to 8 on any particular day such that you will play at least half the time. For this reason, members wishing to join the group should contact the Convenor using the email link above. At the moment we cannot take on any new members. With the subject "Short Tennis Tuesday"
Come and join us for a 2 hour walk (or optional shorter stroll) followed by a pub lunch. You will be most welcome. The Walking Group meets at a prearranged location publicized on a Wednesday or obtained from the convener by phone. Watch this space Locations range from Pont Nedd waterfalls in the east to Rhossili in the west. This group is no longer taking new members. The idea of the group is a great one, a shortish walk followed by a lunch. Perhaps you, with some of your friends, could start a new group. If you might be interested in this idea please contact Adrian using this Email link. There is always lots of help and support for anyone wanting to start a new group. These walks will be 5 – 6 miles long ( 3-4 hours ) and will sandwich neatly in-between our walking group that provides 2 hour walks and our rambling group that walk in the main between 8 and 9 miles. The area we will cover will be based in and around the Swansea area but further afield too, for example Pontardawe, Clydach, Gwaun Cae Gurwen and further west at Llanelli, Burry Port and Ferryside. We are planning our first walk in the second half of September. The walks will be once a month on a Tuesday and will be advertised on the website . Please note a reasonable level of fitness is required . There will be uneven/hilly ground which can be wet and muddy. Sturdy lace up footwear is required and walking boots/shoes a must on inclines and hilly terrain and when it is muddy underfoot. Other examples of what to bring include a packed lunch, fleeces, waterproofs, sun hat and suncream and walking poles and gaiters if used. I aim for a gentle, fun session (with serious intent, of course), that everyone will benefit from, and take into account and adapt for the age (and ailment) range of members. Yoga postures – a variety of standing and floor exercises, modified for particular conditions and problems. Suitable for all – beginners, continuers, returners. if you are interested in being added to a waiting list. Meeting Area: Sketty Park Meeting Day: Monday PM & Thursdays AM. if you are interested in joining the class.